The seventh annual Catholic Schools Convocation was held Aug. 31 at the Cathedral of Mary Our Queen in Homeland. 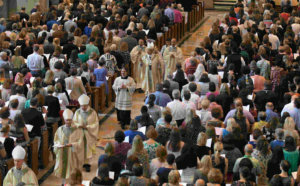 With the 2017-18 school year set to begin Sept. 5, approximately 1,500 teachers and administrators came together for a Mass celebrated by Archbishop William E. Lori and multiple reminders of the urgency of their mission. Teachers with service to Catholic education divisible by five years were acknowledged, including the 27 with 25 years and Victor Janishefski, an art teacher at Calvert Hall College High School in Towson who has given 50 years to the cause. Dr. Barbara McGraw Edmondson received the Doris Musil Award, the archdiocese’s highest honor for Catholic school educators. Edmondson served as superintendent of schools for the archdiocese from 2010 until this summer, when she took a leadership position with the National Catholic Educational Association in Washington, D.C.
Sellinger shared that Nancy Grasmick, former Maryland State superintendent of schools, is chairing the selection committee that will recommend Edmondson’s successor. In adopting the “Year of the Teacher” motto, Sellinger said, “consider it a year-long kickoff” of initiatives and investments in professional development, recognition and recruitment. Bishop Parker offered the keynote address, and likened the challenges facing modern Catholic educators to the ones confronting the Apostles. “It’s hard to say whether the world in which they were proclaiming Christ was any more or less open to hearing the Gospel message than our world today,” Bishop Parker said. “But I think we’d all agree that not only is rising to that challenge worth it, it’s the very reason we are Catholic educators in Catholic schools. 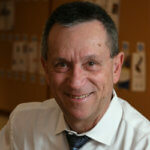 He reminded educators to examine their calling closely. “It used to be that you could take for granted the influence that the faith of their parents would have on our students, but that’s not always the case anymore,” Bishop Parker said. “Many parents aren’t talking about faith with their kids … If that’s the case, or even if faith and discipleship is presented in a lukewarm fashion at home, all the more urgent and necessary is your role in forming disciples. Concelebrants included Bishop Denis J. Madden; Deacon Curtis Turner, principal of St. Frances Academy in Baltimore, who proclaimed the Gospel; and at least eight priests of the archdiocese. The archbishop reminded educators how they can “deeply influence” their students, and called for continuing prayers for those in the greater Houston area devastated by Hurricane Harvey. Amanda Cody, St. John Regional Catholic School, Frederick; Rena Collector, Immaculate Conception School, Towson; Blair Dicriscio, Maryvale Preparatory School, Timonium; Marie Hatfield, St. Louis School, Clarksville; Marianne Kozlowski; St. Margaret School, Bel Air; Phil Lathroum, St. Philip Neri School, Linthicum Heights; Mary Carol Lidinsky, St. Francis of Assisi School, Baltimore; Jerry Rehanek, School of the Incarnation, Gambrills; Michele Ruppert, Resurrection-St. Paul School, Ellicott City; Mary Agnes Sheridan, Notre Dame Preparatory School, Towson; Margarita Unger, St. Maria Goretti High School, Hagerstown; Emily Vandergriff, The Catholic High School of Baltimore.